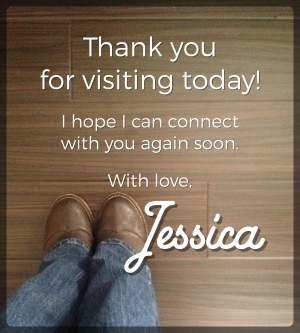 This post was originally published on October 17, 2014, when the Ebola scare was in full swing. Recent events – though different – have stirred some of the same emotions in our collective heart, so I thought it might serve us all well to revisit this message. We’re in this mess together, friends. The other night I woke up in tangled sheets, damp from sweat and disoriented from a dream. The nightmare was still fresh enough in my mind that I walked upstairs to check on my daughter. In my dream, she had contracted the Ebola virus while at school, so I was relieved to find her fever-free and dreaming peacefully herself. Apparently when my mind stopped its survival-mode churning of the day (“wash the dishes do the laundry where are her shoes can’t find my keys why won’t the cat stop shrieking”), my subconscious began to process the day’s main news story. It scares me. It does. I’m not panicking and I haven’t changed much of anything about my daily routine, but yes, I have been thinking about the virus and its unsettling proximity to my comfortable life. And recently, every Sunday morning during church, my mind goes to the suffering of Christians in other parts of the world. I’m keenly aware that my own Sunday morning stress of getting to church on time pales in comparison to others’ real concern of having their faith discovered and being martyred before they make it home for lunch. Really, despite what you might think from watching me, getting to church a few minutes late isn’t the end of the world. More and more, I find myself looking at the world around me and wondering what is happening. There are terrible, inconceivable things happening every day. Media outlets are having a field day with things that terrify, and my Facebook news feed is constantly abuzz with one disturbing story after another. But guys, I don’t. I just don’t. I’m just a wife and mama and friend and sister and daughter, and I hear all of the news today and I react to it very much like you probably do. I don’t know what to do or think or say about any of it. I feel crippled and unable to do anything to make any sort of difference in this freaky messed-up world. I worry about the next 24-hour stomach virus just as much as I worry about the Ebola virus…about my daughter breaking her arm on the monkey bars just as much as I worry about freak terrorist attacks…because truthfully, I’m equally paralyzed to do much about either. The only thing I’ve been able to do lately is cling to the only thing that is certain. I don’t know how religious militants will be stopped and I don’t know how far the Ebola crisis will go before it’s reigned in and I don’t know the next news story to hit the headlines and rock our world again. I don’t know where it will stop……..but I do know that it will. And I do know that eventually, it’s all going to be okay. I know that things aren’t as out-of-control as they appear. I know that as much as it seems like every flickering hope is being extinguished by the darkest forces of evil, light will not be contained. I know that while we hear of news that ominously points to our nation at war again, our greatest enemy has already been defeated and the biggest battle is over. 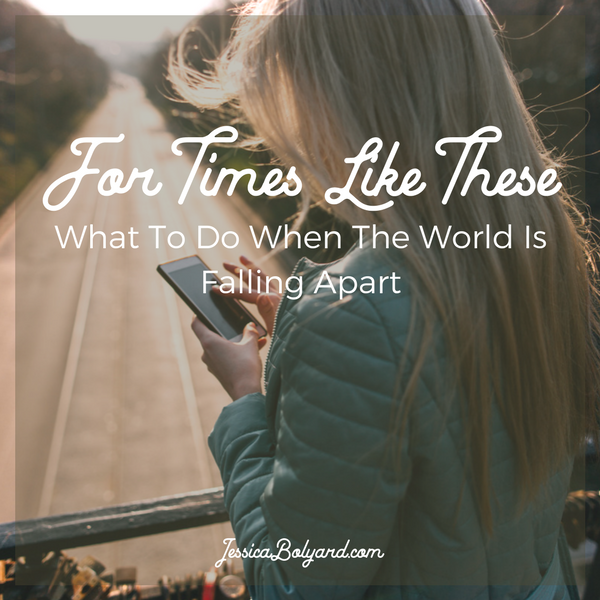 I know that even when the world is chaotic, we still have a God who puts things in order. I know that when things are darkest, that is when the Son is poised to do His most magnificent work. 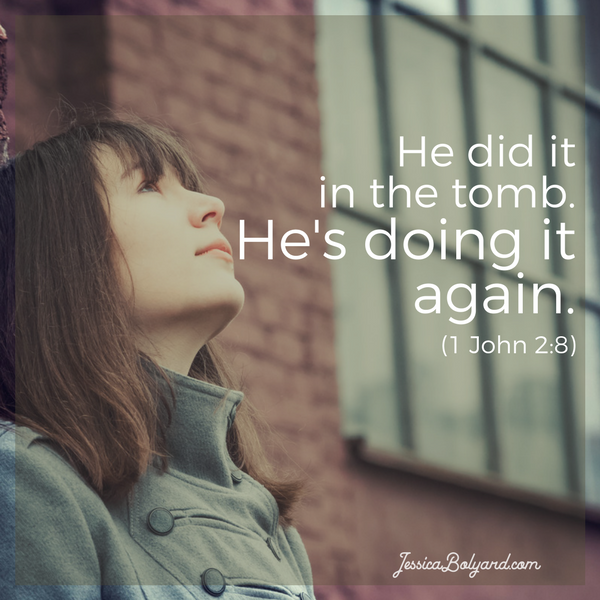 He did it in a cold, stale tomb. He can do it again. Sometimes I write from great revelation and I feel like I maybe I’m giving you something you need. Sometimes, though, I write because I need to figure out what I think, and when I put into words the things I’m uncertain about, I remember what I already know. I did all I could do in the moment: I shrugged my shoulders and nodded. 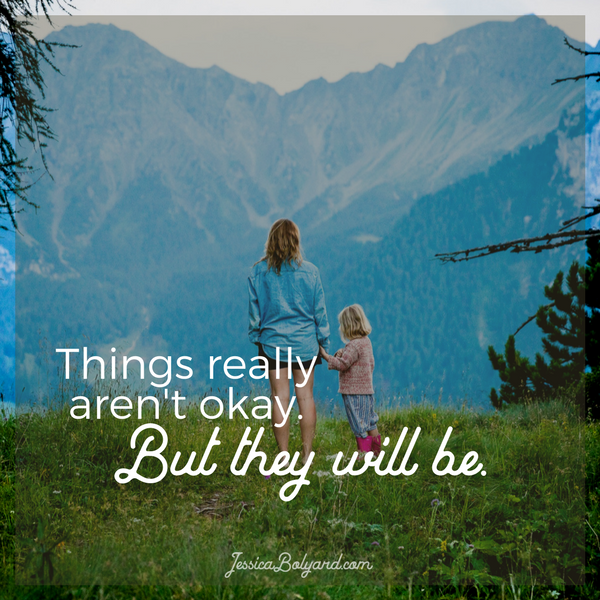 I told her that no, things are not okay….but that they will be. And I say the same to you today, friend. Things are not okay, but I can promise you that they will be. So today and this weekend and next week when you turn on the news to find out the latest inconceivable reality, remember this: we may not have all the answers or know how to respond, but we serve the One who does. The picture is bigger than we realize, and the story is far from over. Maybe that’s a simplistic way of seeing things, but I think maybe that’s good. Things are already complicated enough. Whether it has anything to do with YOUR words, I don’t know. But for ME, I can only keep my eyes focused on what I can control and handle with Gods help. I can pray for those who suffer, those who go to bed each night hungry, for those mothers and fathers who fear that their child will not see tomorrow. I can only pray and keep my faith that He knows and has a plan. You were reading my mind today. Thank you for this and for reminding us that God is in control. Love you lady!